Depending on the time of year you visit Stockholm, you will experience or witness different traditions. The Swedes are a people who love their customs and it usually involves food and snaps. In winter there are the usual traditions of Christmas and New Year, and Stockholm is awash with beautiful Christmas lights and trees. To see the biggest Christmas tree in Northern Europe head down to the quayside on Skeppsbron in Gamla Stan where a fantastically evenly-proportioned tree dominates the night sky. The window displays, the twinkling lights and the New Year’s Eve fireworks are all great things to see in Stockholm during this season. Christmas is celebrated on 24th December with a Christmas buffet that includes ham, herring, meatballs, salmon, beer and snaps. Prior to Christmas, December 13th is the interesting Swedish tradition of Lucia. Early in the morning in schools, churches, workplaces and hotels, girls dressed in white arrive in a vocal parade to bring light to the darkness. It’s a beautiful tradition and very atmospheric. Come springtime, the weather is starting to improve and several national holidays are taken. Easter is a long weekend and a time for Swedish families to gather. Stockholm is often quiet around this time as residents often travel outside the city for their celebrations. Typically people eat herring, salmon, lots of eggs and drink beer and snaps. The last day of April – Walpurgis Eve – huge bonfires are built around the city and crowds gather to watch the flames and listen to choirs to welcome the spring. A good place to catch this impressive tradition is Riddarholmen next to Gamla Stan. The following day, May 1st in Labour Day in Sweden and in Stockholm you will see demonstrations and speeches being held in many of the public squares and parks. Then there’s Ascension Day towards the end of May. No special traditions are associated with this but as it is a four-day break, many Stockholmers take the opportunity to go out of town. On June 6th Sweden has it’s national day. It’s a fairly new public holiday and usually means an opportunity for people to be off work and be outside to enjoy the weather. Celebrations are held at Skansen and in Kungsträdgården park and in the City Hall a ceremony takes place for everybody who has become a Swedish citizen during the year to welcome them into Swedish society. Around June 20th, it’s time for Midsummer’s Eve. Stockholm is often quiet on this day as shops and restaurants are shut. Residents head out to the countryside to celebrate this time with friends and family. Celebrations involve dancing around a maypole, eating herring and potatoes, playing games, drinking snaps. Needless to say, many babies are made during this long, light summer night. In Stockholm, Skansen has a Midsummer celebration for those left in town which is a fun way to experience this very Swedish tradition. 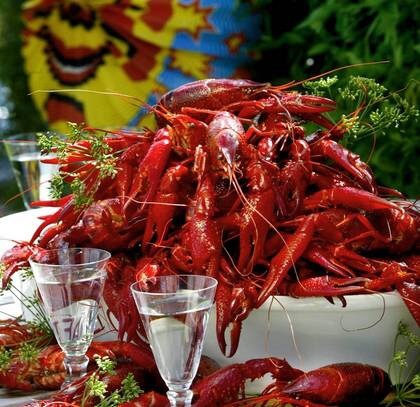 In late summer, early autumn it’s time for the crayfish party. Friends, colleagues gather to eat crayfish, sing songs, drink snaps and party. It often signifies the last days of summer before heading into the darker season. Many restaurants offer crayfish on their menu at this time of year. Another food-related tradition in the autumn is the ‘surströmmingspremiären’. This is the gathering and eating of fermented Baltic herring. Far from everybody follows this tradition, as it is an acquired taste. The herring ferments in a tin and is opened outdoors due to its pungent reek and eaten with bread and potatoes. On the cusp of autumn and winter is All Saints Day. While Halloween is becoming more popular in Sweden, it’s not a traditional Swedish celebration. On All Saints Day, people go out to the cemeteries and light candles to honour their loved ones. It’s a beautiful tranquil sight to behold as dark descends to see the crisp twinkling candlelight illuminating graveyards around the town.